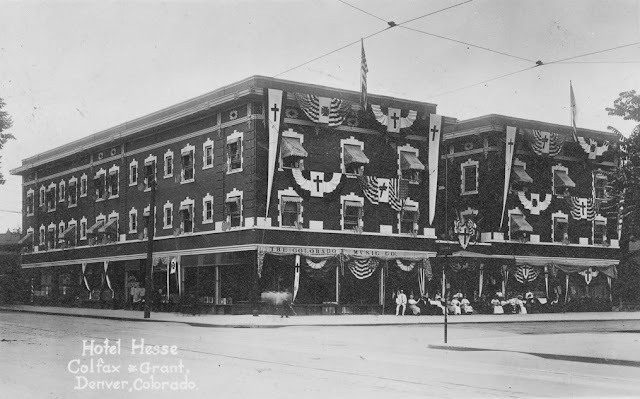 In 1911, when the State Capitol Building was only 17 years old, Hotel Hesse opened at the corner of Colfax and Grant; shortly after, due to anti-German sentiment during WWI, the hotel was renamed the Newhouse. Running underneath much of Capitol Hill are tunnels which connect the Capitol Building with many of the surrounding businesses, and in the 1920's these tunnels were reportedly used to sneak politicians into the hotel for booze and affairs.The tunnels have long since been sealed up but for over one hundred years the Newhouse Hotel has operated in the bustling Capitol Hill district of Denver. Under new management in recent years, a major undertaking at restoring the building to its former glory is well on its way. While the hotel does offer nightly rooms at competitive rates as well as some of the least expensive weekly rates in the most convenient location in Denver, reservations are not accepted due to the fact that guests often check in and decide not to leave... sometimes for years!